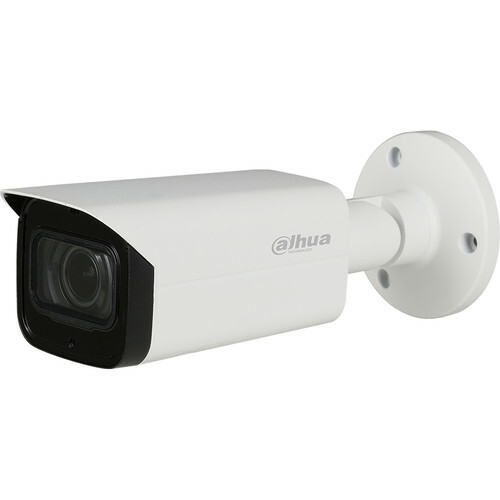 The Pro Series DH-IPC-HFW4239TN-AS 2MP Outdoor ePoE Network Bullet Camera from Dahua Technology uses a 1/2.8" STARVIS progressive scan CMOS sensor to capture 1080p resolution video at up to 60 fps. The 3.6mm fixed lens delivers an 87° horizontal field of view. Two-way audio communication is possible thanks to an audio input and output. An onboard memory card slot supports microSD cards up to 128GB. microSD cards are available separately. Integrated PoE technology simplifies connectivity by enabling the transfer of power and data through a single cable. Additionally, ePoE technology offers a cost-effective solution for transmitting power and data over long distances via Ethernet or coaxial cables. This bullet camera is ONVIF-compliant for profiles S and G, making it compatible with a wide range of surveillance devices. The camera's IP67- and IK10-rated metal enclosure ensures that it can be used outdoors in areas at risk of vandalism. Box Dimensions (LxWxH) 12.25 x 6.35 x 5.75"